Compared with other primary Spanish and European cities, Madrid is the perfect place to establish a business thanks to its low cost of living, affordable labour costs and expanding real estate sector for offices and industrial sites. Given the high level of qualified talent, Madrid is very competitive in terms of labour cost. The average cost per employee is € 3,105 per month, representing € 23.79 per hour (INE). This mirrors Spain’s affordable labour costs in comparison with other EU countries. Spain ranks 13th in the EU ranking, well below the average, as well as being lower than direct competitors such as France, Germany, Italy or United Kingdom. Source: Eurostat, Labour costs. Labour costs per worker and hour in the EU – 2016 (euros). The real estate market for offices is growing again after the recession and Madrid is the 3rd most active location within Europe’s expanding real estate sector (BNP Paribas Real Estate). This expansion has boosted the supply and demand for services resulting in a high level of investment and availability of suitable premises for office use. New properties are being developed, particularly in the CBD. During the first half of 2017 the availability rate was estimated between 10% and 12% and the contract volume was between 85,000 and 110,000 sqm. Central Business District (CBD): along the Prado-Recoletos-Castellana axis and the North area. Secondary centre: within the M-30 ring road. Outskirts: outside the M-30, especially on the transport axes. The rental prices for the logistics and industrial market in Madrid are in line with other primary cities in Southern Europe such as Paris, Rome, Milan or Lisbon, as well as other cities such as Brussels and Berlin. However, Madrid is almost 20% cheaper than Barcelona and around 30% cheaper than most centres in Central and Northern Europe, as well as the British islands. The availability rate is estimated around 7%. Source: Prepared by the authors based on data supplied by real estate agencies. First ring: the most central zones with some kind of industrial/logistics activity. 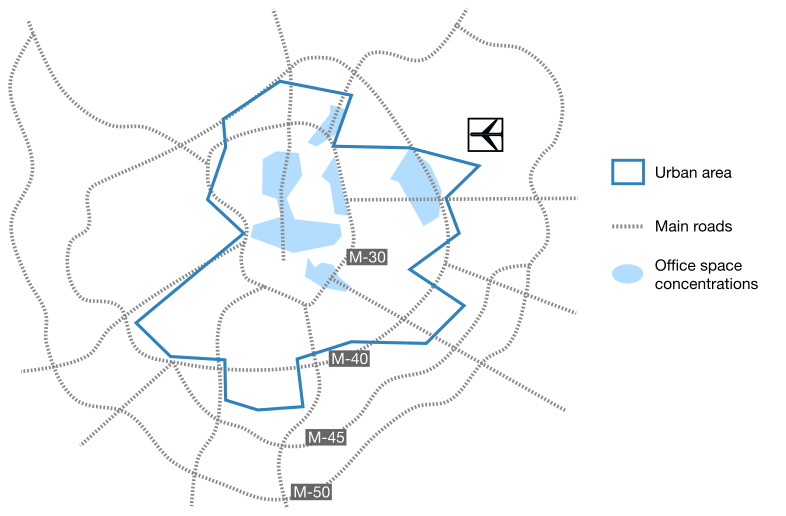 Outskirts: industrial areas located along the highways (A-1 to A-6) within Madrid metropolitan area. Thanks to its low cost of living Madrid is the perfect place to establish a business for quality of life and happy employees! Zurich: Madrid is around 100% – 115% cheaper in the terms of consumer prices and average rent price. Paris: Madrid is 50% to 60% cheaper in the terms of food basket and rent prices. Looking outside the EU, you won’t see Madrid in Expatistan’s rankings of the 130 most expensive cities in the world, or among the 50 most expensive cities in Western Europe!